Lovable ogre Shrek (voiced by Mike Myers) was going through a midlife crisis. He missed his old life in the swamp when he was able to do whatever he wanted whenever he pleased. Gone were the times when people would see him and scatter about in fear. After storming out of a party and having an argument with his wife Fiona (Cameron Diaz), Shrek ran across the devious Rumpelstiltskin (Walt Dohrn) who was too conveniently trapped under a carriage. Supposedly grateful for being rescued, Rumpelstiltskin, experienced in dark magic, offered Shrek a proposition: Shrek could spend 24 hours in the past if the magician could take any day from Shrek’s life. Before he knew it, the green ogre’s new world was entirely different. 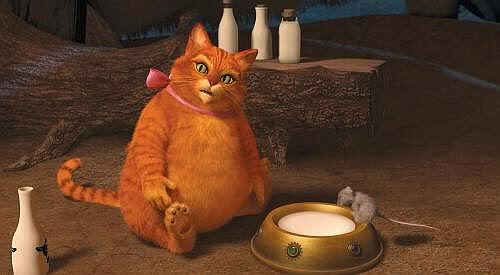 Donkey (Eddie Murphy) was no longer his best friend and Puss in Boots (Antonio Banderas) was now a fat cat who could not even lick himself. While I do think that the fourth installment was the best since the first in the series, I failed to see anything special about it. I could feel the voice actors being enthusiastic in playing their roles, which was great, but I didn’t think the jokes were fresh enough to keep me constantly entertained. The familiar characters being completely different in the alternate universe became a running gag that grew tired quickly. I wanted the script to poke fun of Shrek’s so-called midlife crisis more consistently. I almost missed the random pop culture references because even though they came out of the blue, they managed to surprised me. Everything in here felt like a rehash of the first three “Shrek” pictures driven by the concept of Frank Capra’s “It’s a Wonderful Life.” It didn’t take enough risks so the experience was far from rewarding. The subject of alternate universe had been explored so many times that we’ve grown tired of the formula. The “Shrek” franchise, being a satirical jab at fairy tales and pop culture, could have challenged that familiar formula and invigorated the story. Sadly, despite the swashbuckling adventures on screen, the storytelling was too safe, even predictable. Half-way through the picture, I thought it needed an inspiration to keep going. Even the big lesson that Shrek learned in end could be seen from very far, far away. Directed by Mike Mitchell, “Shrek Forever After” was completely breathless as it reached the finish line. The actors and the filmmakers assured that this was the last picture of the series. Unless the writers have truly creative ideas for a fifth movie, I suggest it remains in a deep slumber.